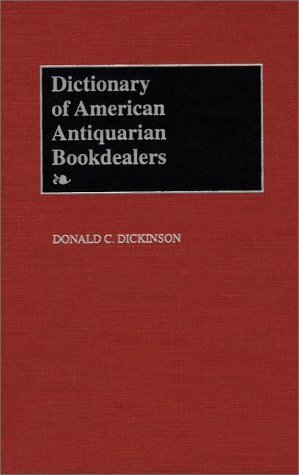 The first published reference source to bring together biographical information on American antiquarian bookdealers, this book provides librarians, dealers, and collectors with useful information on those dealers who were prominent in securing and distributing used and rare books, manuscripts, maps, autographs, documents, and ephemera. The book covers 205 notable dealers who died before August 1, 1997. Prominent dealers are identified as those who carried quality stock, issued carefully documented sales catalogs, participated in professional organizations, and helped develop important private and institutional collections. The book considers such well-known figures as Abraham Simon Wolf Rosenbach, Charles Sessler, and Hans Peter Kraus. Each profile describes the dealer's subject specialities, the style of catalogs and sales lists issued, the dealer's impact on private and institutional collecting, professional activity, and, when relevant, the final disposition of the dealer's stock. Entries conclude with a selected bibliography of sources. The information, drawn from both primary and secondary sources, will be useful to library reference workers, bookdealers, collectors, and anyone interested in the history of the American antiquarian book trade.